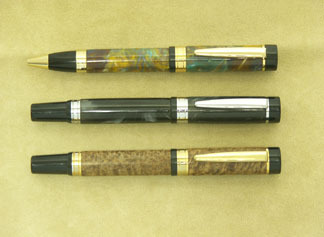 HUT™ Products offers three styles of pens for the person that likes the feel of a larger pen. 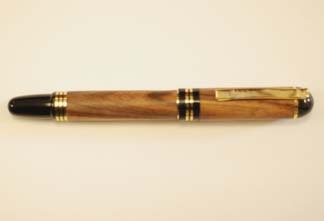 The Fat Pen (sometimes called the "cigar pen") is beautifully crafted with distinctive black and gold components. The Fat Pen comes in Upgrade 24k Gold, Chrome, and Titanium Gold. The Fat Pencil in Upgrade 24k Gold make a perfect companion for the Fat Pen in Upgrade 24k Gold. The Fat Letter Opener in Upgrade 24k Gold completes the set. The Titan™ Rollerball and Fountain Pens come in Titanium Gold and Chrome. The Titan™ Rollerball Pen also comes in Upgrade 24k Gold. The Titan™ Ballpoint Pen can be either a pen or a pencil just by changing the refill. This Twist Pen comes in Upgrade 24k Gold. 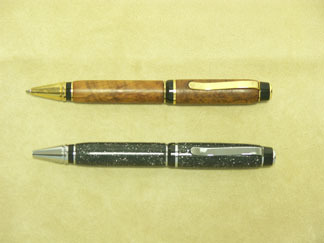 The Churchill Pen and Fountain Pens are availible in both Upgrade 24k Gold, and Sterling Silver.